Make a stunning display with this unique floral collage pieced together with hand-cut paper leaves. Add a burst of flowers to your bedroom walls or living areas with this beautiful piece of art that you can make in any color to match your decor. Leave them on the tabletop with a stand like we have or mount them on the walls of your home or office. 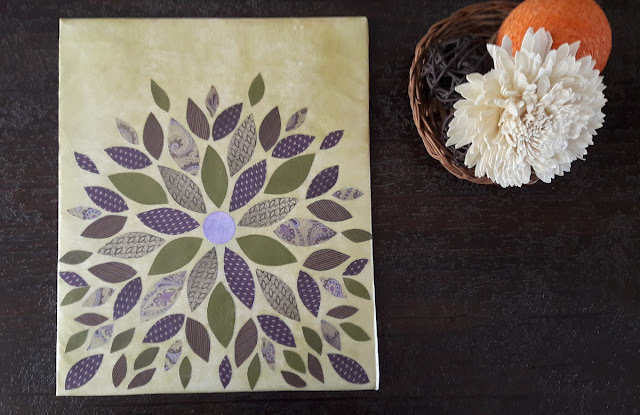 All this project really entails is cutting and gluing the flower petals on the canvas, so with a little bit of work and a good amount of decoupage medium you will get your lovely artwork ready in just a matter of hours. Next you will have to pick your pattern paper or fabric in a various colors, patterns and sizes. This process is very much like quilting fabric. The variety in scale adds a lot of interest to your artwork. Now you want to prep your canvas base. You can either apply acrylic paint directly on the canvas or ink a plain paper with the paint roller and adhere it to the canvas like we have done in this case. Even if you choose to have a white background, we recommend you to paint the canvas in white paint so if there are any patches that you want to hide later you can do so by applying another coat of paint. Cutting the petals and assembling the flower is bit time consuming but very easy. 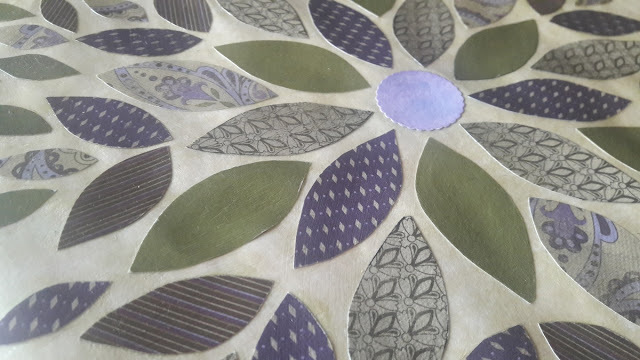 Simply cut 'petal shaped' pieces from paper and a circle for the center. Do not worry about having a perfect cut of your petal as it won't matter. 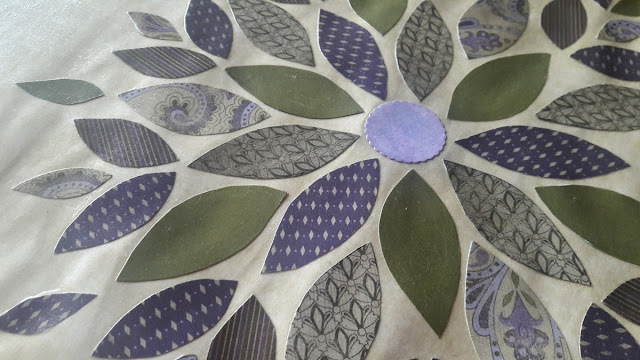 Once the cutting is done, place the circle at your desired location and start arranging the petals around it until you have achieved the pattern you are happy with. Here you can have many variations for e.g. you can start with one corner of the canvas and work your way up or place the circle at the left most or right most center of the canvas and arrange the petals around it. It's completely up you. Once you your layout is ready, glue the pieces using a drop of glue. You only want to secure your leaves to their respective position. Fold over the pieces on the side. 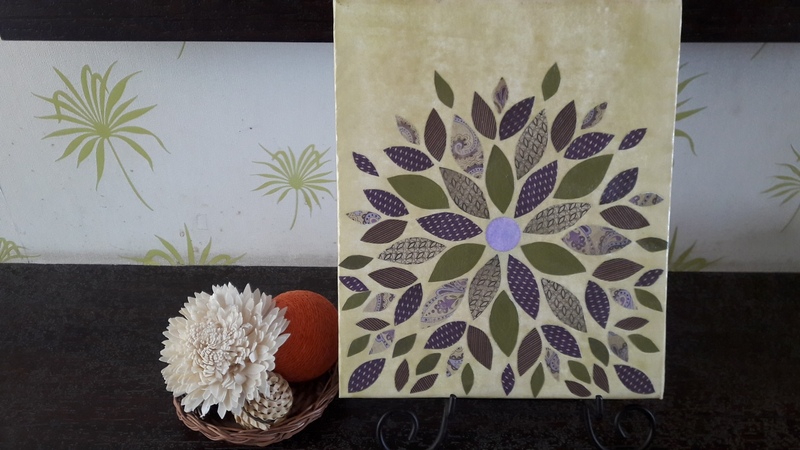 Finally, use a decoupage medium like Mod Podge to stick the pieces to your canvas. Be sure to coat the top, the bottom and the sides of your canvas. Apply another coat of Mod Podge to the entire canvas and do not worry about the mix brush strokes because it really creates a cool effect after its completely dry. Once dry, you can either add calligraphy or stamp a sentiment to your project if you wish. Use our projects as a tool for your inspiration. You can choose to replicate the entire project as is or tweak it with your favorite colors and embellishments or use it as an idea for creating something even more interesting! 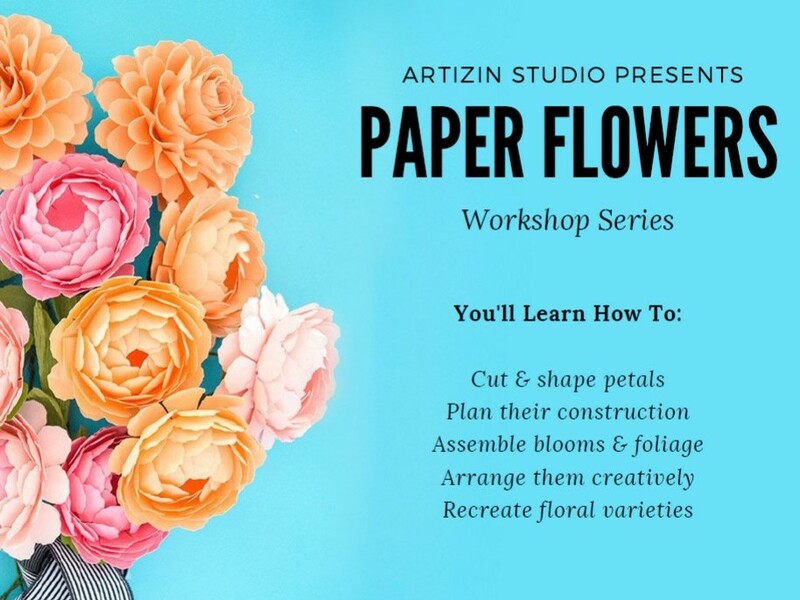 No matter what your crafting skill level, there is always a project for you at Artiz.in. Be sure to sign up below to get DIY projects, creative inspirations, special offers and much more delivered straight to your inbox. As always, if you try this... make sure to share pictures of your project on our social sites using hashtag #lovetocreatewithartizin! Facebook | Instagram | Pinterest | Twitter.